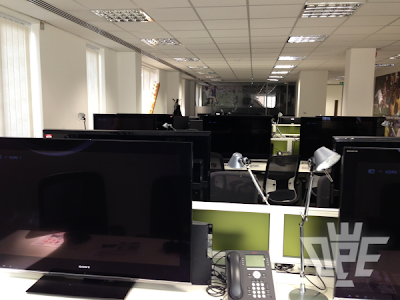 Last week, I travelled to Konami's new UK-based PES Production Studios for an early hands-on with PES 2014. Situated in the beautiful, traditional town of Windsor, about 25 miles from the centre of London, the location was perfect for an event like this. After all, with English temperatures soaring to a whopping 24°C, what better way to spend a sunny afternoon locked in an office playing video games? Looking back though, sacrificing one day of good weather was undoubtedly worth it. As soon as the referee blew his whistle to begin yet another season of Pro Evo, I realised that this new game was unlike any other current-gen PES title. Compared to past releases, the improved graphics and brand-new animations were superb. Clearly, with the arrival of a game-changing game engine, Konami are playing a totally different ball game now. My favourite feature, which was immediately noticeable, was the improved presence of physicality: the 50-50 challenges, the aerial duels, the shoulder barges, and everything else that's now possible thanks to the new engine. 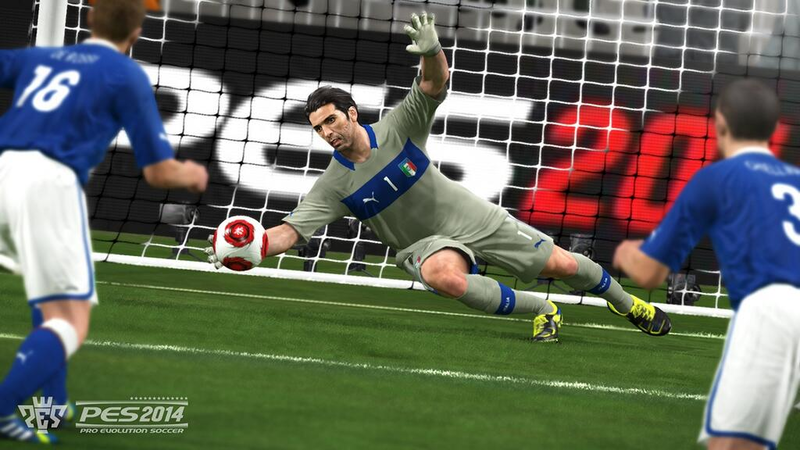 For the first time ever on this generation of Pro Evolution Soccer, matches felt like genuine contests. I remember repeatedly saying "wow, this is amazing" every time my players - big and small - managed to shrug off challenges and leap like salmons to win attacking and defensive headers. It really is an amazing moment when you first see your holding midfielder climb up and win an aerial ball on the edge of his own box, and then two seconds later, to see him dribbling past the half-way line after he's just thrown himself into a 50-50. I actually found winning these type of challenges just as enjoyable as beating an opponent in a 1-on-1. Yes, defending is fun again. 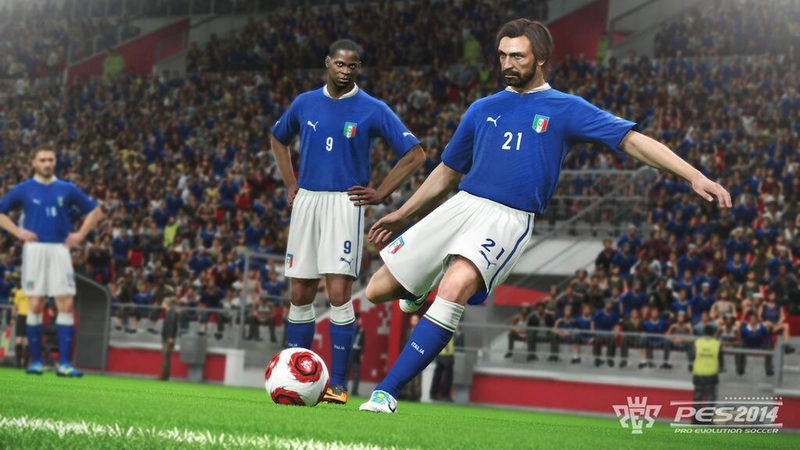 Whatever you've played for the last seven years, the fact that PES has finally introduced its own fully-functional collision system is good news for every video game-playing football fan. When I played with Dante, he was an absolute rock in the heart of the Bayern defence. He wasn't unstoppable - nor were the high-profile attacking players like Robben, Ribery or Neymar - but his strength definitely provided me with a defensive advantage when I needed him. 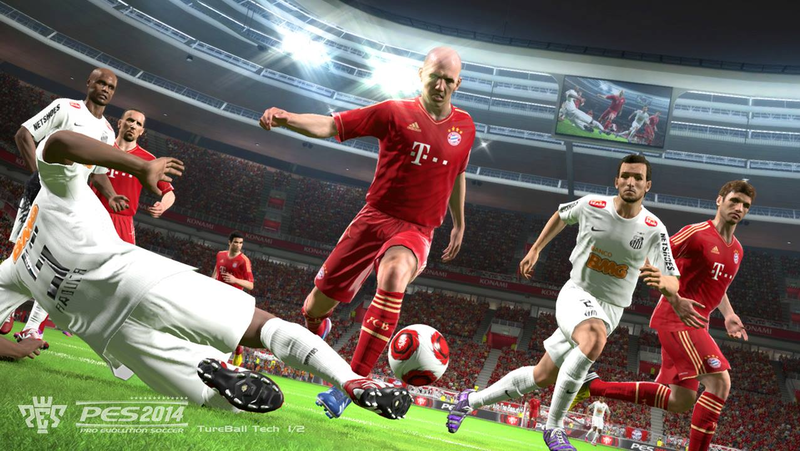 Promisingly, it appears the better players of PES 2014 will be determined by skill, rather than serendipity and taking advantage of the game's exploits. Like the real sport itself, the more time you put in at the training ground, the better player you'll eventually become. And what's more, I didn't see any bugs or 'fails': no players constantly falling over each other in a seemingly endless and unavoidable loop, no players levitating - like The Gentlemen from Buffy The Vampire Slayer - through adboards and into the 2D crowd, and most importantly of all, Geordie strikers and Polish goalkeepers kept themselves to themselves... which should always be the best route to take when making a football game. The new system, called MASS (short for Motion Animation Stability System), looked realistic and it worked - at the first time of asking, too! Staying positive, I was particularly impressed with the increased amount of freedom. The improved passing system is challenging, enjoyable and rewarding. And much to the delight of every PES fan, crosses have been totally overhauled and are now, once again, unpredictable (in a good way). To get the rewards, you're going to have to show much more thought when playing your passes now - resting on your PES 2013 laurels will get you nowhere in this game. Is ping-pong football dead and buried? It's too early to say. I certainly hope so. But the good news is that players will often be punished if they're careless with their passing. 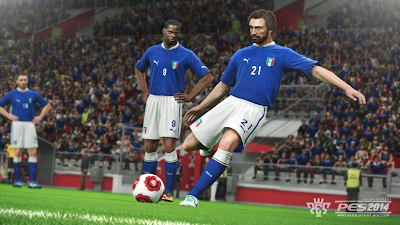 As PES commentator Jon Champion often suggests, players must treat the ball like a friend. This is fact: don't respect the ball and you won't be scoring goals. You'll find yourself defending throw-ins instead. Speaking of which, the new continuous play runs smoothly and works incredibly well. At such an early stage of development, I was expecting a few issues here and there, but from what I experienced on the day, there were no problems at all with the seamless play. It's pretty simple - if the ball is reachable, your player will go get it, run back to the touch-line and prepare to take the throw-in. Fortunately, the pitch at the Allianz Arena is surrounded by adboards so quick throws-ins were regular throughout the session. Naturally, quick free-kicks were less frequent but I'm happy to say they appeared to be much more reliable than what we were given in PES 2013. Sticking with freedom (a common theme to this article), users are now able to quickly change their set-piece taker just by clicking a few buttons. It's really simple. Hit Select and a list containing your starting eleven (goalkeeper included) will appear on the right-hand side of the screen allowing you to make the appropriate change for the free-kick, corner, throw-in, etc. Personally, I've been asking for this feature for a long time and I'm delighted to see the flow of matches has been immensely improved. Interestingly, throughout this whole process, the players and fans will continue to flow in the background which is a really nice touch. Defenders are much more switched on, allowing more interceptions and less 'moments of madness', like your centre-back getting nutmegged from 50 yards after making no attempt to cut out the simplest of through balls. I did, however, get the impression that the defensive lines were a little too high at times. This resulted in quite a lot of offsides which was quite frustrating. However, to counter this, when taking goal-kicks, you can press L1/LB to activate 'Position Shift' which will move your entire team up (or down) the pitch. Whether you're desperate for another goal or you just want to protect your lead, I can see this becoming a very popular tactic during online play. Back to the defensive side of things, players will sometimes miss the ball when going up for headers. But don't start thinking this will make the game unrealistic. Like we see in real life, for players like Kevin Davies, Carlos Tévez, Mario Mandžukić and Luis Suárez, leaning into and putting off defenders is a vital part of the game. I'll also stress that timing is very important in PES 2014; be lazy and press X too early or too late, and you'll get brushed aside by your "weaker" opponent. A lot has been said about the free-kick guidance bar. After receiving a lot of feedback at E3, Konami have since tweaked the system as set pieces were, according to Manorito Hosoda, "too easy to target". The adjustments have already been made so shots now depend more on the kick taker's attributes. Unfortunately, I didn't get the opportunity to take many free-kicks so I feel it would be unfair to make any further comments regarding this feature. As for penalties, I only took one. I went down the middle and it was saved by the AI. When facing the goalkeeper, there is now a target on the goal, which you can turn on and off. With this new system in place, it looks like users will have much more freedom when deciding where to place their penalties. For those wondering, I can only assume chipped penalties are in this year. I will have to double-check this with Konami though. The improved goalkeeper throw-outs are excellent. Whether you opt to go over or under the arm, you have an unprecedented level of freedom with your number one now. Even with drop-kicks, you'll have the chance to catch your opponent by surprise by starting a swift counter attack. On the other hand, if you're ahead in the game and want to maintain your lead, you're now able to cancel your throw-outs. For example, if the pass is no longer 'on', or you're worried about your opponent intercepting your pass, just press X and your goalkeeper will fake the throw allowing you to rethink your next move once more. Sometimes, it's the little things which are the most important. Either way, the risk of conceding 'cheap goals' has been massively reduced. Goalkeepers have been improved in certain areas, like during one-on-ones, but I feel they're far from the finished article. Apart from when gobbling up miscued crosses, it didn't really feel like goalkeepers had a big presence in their penalty box. I found they were generally better when saving controlled (R2/RT) shots, but I admit that some of the goals I scored felt 'too easy'. After a few games, I knew if I put enough power on the shot and kept it on target, 9 times out of 10, I'd get a goal. Whether the shooting is too strong or whether the issue lies with the 'keepers, I'm not entirely sure. But I did suggest to Konami that it would probably be wise to investigate. The majority of screenshots released in recent weeks show a clear improvement in facial expressions and the delivery of player emotion. Before, during and proceeding E3, Konami have repeatedly stated that 'Heart' will play a huge part in Pro Evo this year. But not only will emotion look good this year, it will feel good as well. Motivation levels will influence a player's performance which can ultimately affect things like crowd noise and even the in-game commentary. The form arrows remain - however, don't be too alarmed if your star player is "on a purple". A high level of motivation may be just enough to cancel out a low form arrow - just like how Walter Montillo, on a purple arrow, gave a man-of-the-match performance for my Santos side. Although it's important to point out that just because your side has a high motivation level doesn't mean your players will all start to run faster. According to Manorito Hosoda, it's a much more subtle and realistic process - one example is that your players can become more determined to win loose balls. For about 30 minutes, I played against the AI and committed as many fouls as I possibly could. The onlooking spectators - including Konami staff - probably thought I was some kind of Roy Keane idolising maniac who had somehow slipped out from his straitjacket. On the contrary, I was perfectly aware of what I was doing. I was looking for two very important things; while also 'testing out' the referees, I wanted to see how players reacted when receiving cards. With Arjen Robben, I remember getting booked after tripping Santos' Paulo Assunção. As soon as the referee showed the yellow, the Dutchman protested the decision by shouting - with authentic mouth movements - clearly showing his anger and utter disbelief in the decision. It was a similar animation to what we currently see in PES 2013, but the improved facial expressions (the emotion) had been significantly improved and made the cut-scene a whole lot more convincing. As for the referees, they seemed generally improved but I do think they need work; there were some odd decisions where obvious fouls were not picked up. I fed this back to Konami, so there's plenty of time left for them to investigate. On the other hand, I'm ecstatic to confirm that match officials do play the advantage rule. Furthermore, they're more than happy to let the game flow, and of course, if they need to, go back and hand out cards once play has stopped. Konami told us they are still looking to make improvements - through positive and negative feedback - so don't be surprised if there are a few changes between now and the game's final release. 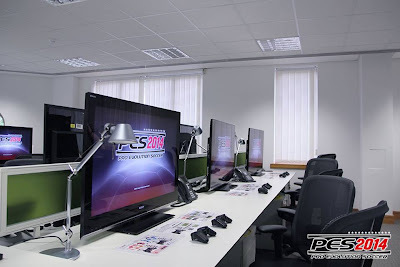 Nevertheless, I have played pre-release PES for the last three years and it's encouraging to know PES 2014 is the game that's left me with the most amount of optimism and the least amount of concern. It's still early days but I firmly believe the PES Team are heading in the right direction. And from what I've seen so far, I'm confident Konami can end current-gen on a high before they switch their focus onto PES 2015 and the next-gen consoles. 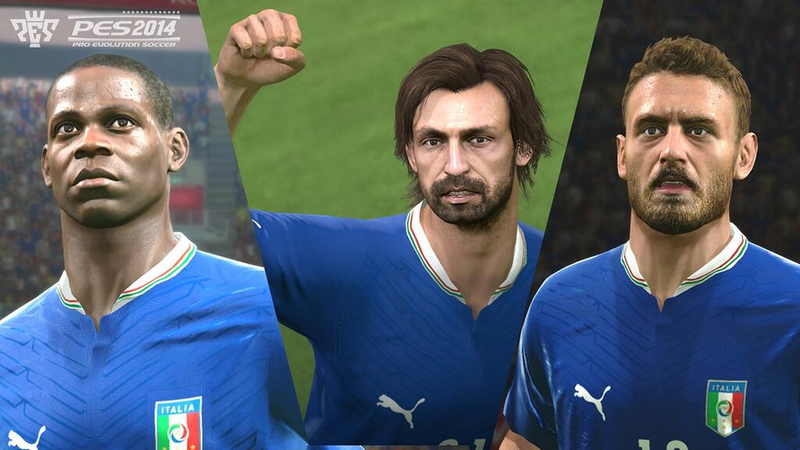 By implementing the six pillars of PES 2014, Konami are trying to allow more giant-killings... and if things continue the way there are, they might just get one of their own. - Also make sure you check out my Q&A with PES Marketing Producer Manorito Hosoda where I talk to him about handballs, the new edit mode, online cheating and much more.